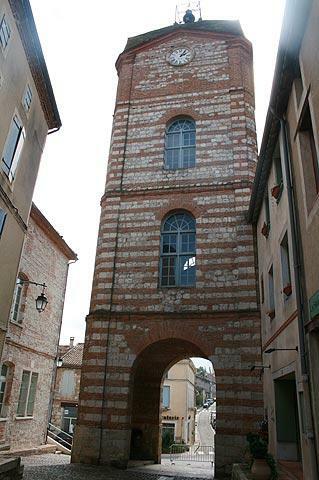 Auvillar is a village between Agen and Montauban, on a rocky outcrop overlooking the Garonne River. 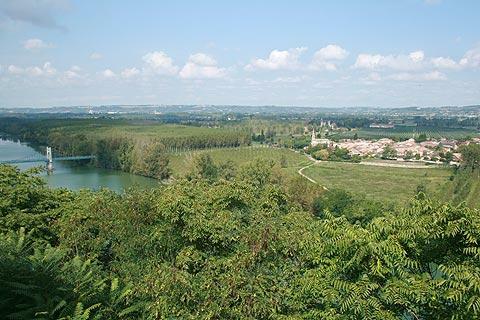 It is listed as one of the 'most beautiful villages of France' and because of its impressive raised location, Auvillar has far-reaching views across open countryside. Found along one of the original pilgrimage routes to Santiago di Compostella that pass through this region Auvillar has a history dating back to the Romans, with its importance arising from both its raised position and its access to the navigable Garonne River. 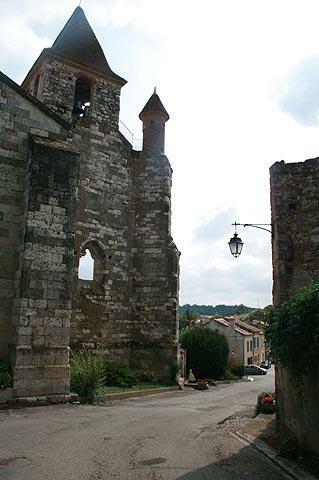 Perhaps best described as small but perfectly formed the village of Auvillar is surrounded by ancient fortified walls, with gateways granting access to the centre. One of these passes under the 17th century clocktower and was built in the position of a drawbridge which once gave access to the centre of the village. The clocktower is unusual in that it is made from alternating levels of white stone with the typical red-brick of the region. France This Way comment: Auvillar is quite a small village that doesn't take long to explore but the unusual architecture and village centre make a visit recommended. The centre of Auvillar is based around the Place de la Halle, an attractive cobbled triangular 'square' lined with three rows of arcaded houses dating from the 17th and 18th centuries. The arcades, built in the trademark red-brick of the region, are very attractive, and the centre of the square is dominated by a very unusual circular market hall that dates from the early 19th century - built in 1825 it replaced a more conventional rectangular hall that previously stood in the same position. 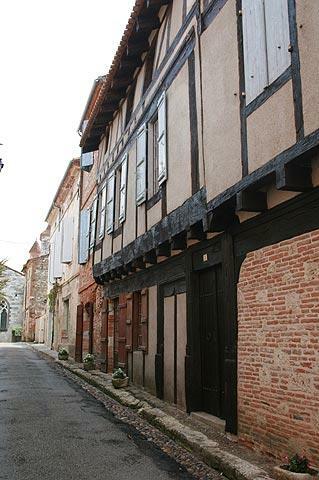 Leading off from the centre you can explore more streets lined with ancient houses such as Rue des Nobles and Rue Obscure. 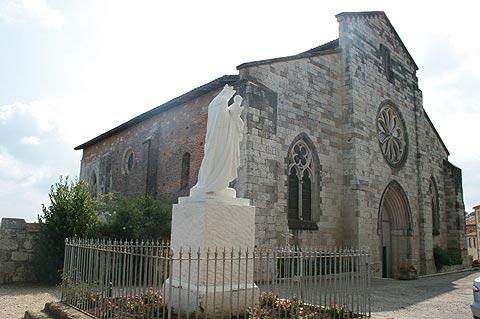 The Church of Saint-Peter has its roots as a Benedictine priory dating from the 12th century although the small chapel to the rear of the church is the only remaining part from this time. The rest of the church has been modified, repaired and rebuilt several times over the centuries, in part due to damaged during the Hundred Years War and the Wars of Religion. Inside the church the choir section and an altarpiece in painted wood are the highlights, as well as a crypt which contains the church treasury. 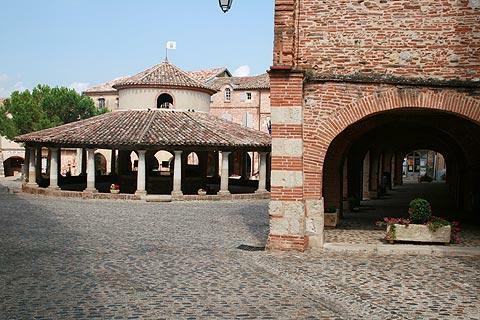 Another important religious monument in Auvillar is the chapel of St Catherine with an attractive red-brick entrance and contains some medieval frescoes. The chapel was where the boatmen would say their prayers for protection before setting off on a voyage. Also just off from the edge of the centre (passed the Auvillar tourist office) there is is a large grassy area. This was once the location of the Viscount's castle and has far-reaching views across open countryside, and down to the ironwork bridge that crosses the Garonne river below. Another viewpoint is found just behind the church. Auvillar prides itself also on its association with the arts, and frequent exhibitions are held in the hall of the office of Tourism. Several artists and potters have established themselves in the town and vicinity. 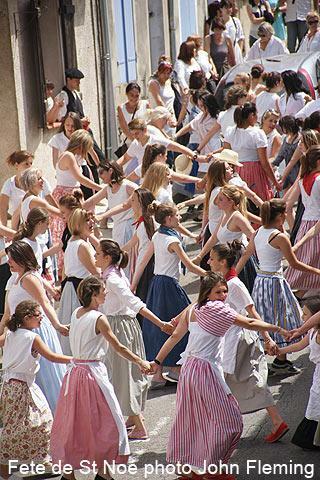 There is also a jazz festival at Auvillar around the middle of July each year. A small museum in Auvillar marks its history, in which boating, and also pottery and quills (feather pens for writing) played a significant role from the 17th to 19th centuries. The Musée de la Batellerie is in the clocktower. 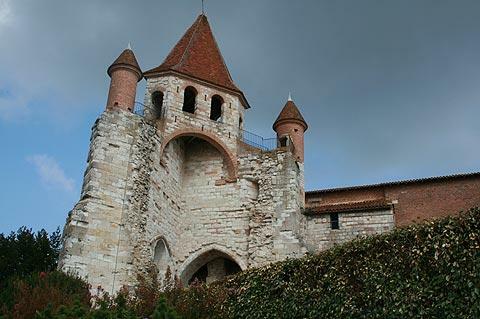 Well worth visiting when you are in the vicinity are the pretty villages of Bardigues just four kilometres from Auvillar and Saint-Michel et Monbrison. 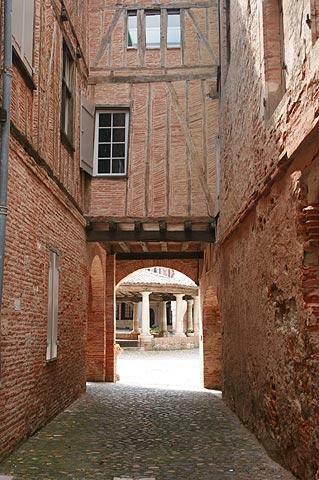 The cloisters at Moissac are also unmissable.